A new version of the very popular Needle Gauge. This time without the cutting tool. 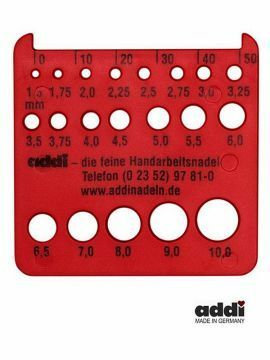 This handy red knitting needle gauge lets you check the metric size of your needles, measuring sizes from the finest 1.5 mm up to superchunky 10 mm. This gadget comes with a scale marked on it in centimetres up to 5 cm and unlike the black gauge it has NO blade for cutting yarn.